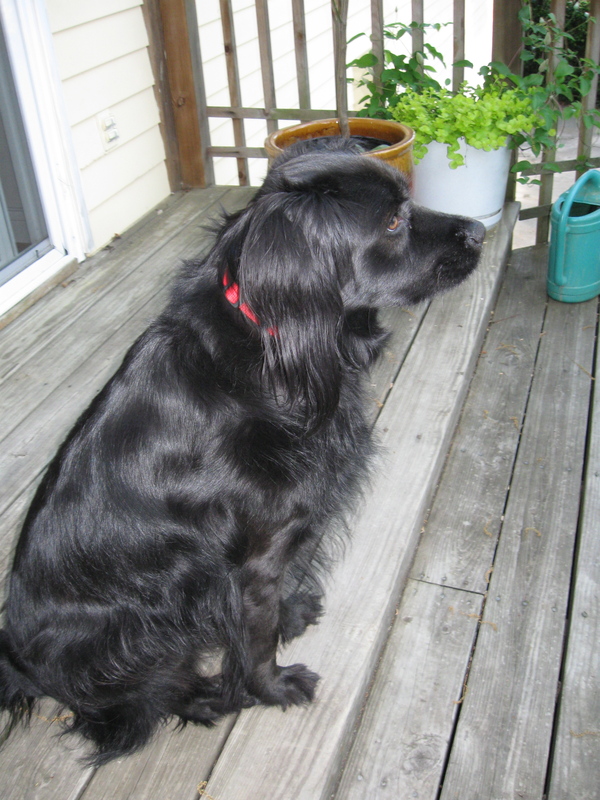 This is Jesse the dog, looking stately and wise (I think) in his preferred elegant ensemble of sleek black, accessorized in red. One particularity of Jesse is his terror of bodies of water larger than a water bowl. In the hottest summer, when other dogs splash, swim, dash and retrieve in the nearby Tennessee River, Jesse may wade in gingerly up to his doggie elbows and pant. On a midwinter visit to the Florida Panhandle, when the Gulf was smooth and the waves no more than a hand high languidly sliding to shore, a modest “plop” had Jesse airborne, spinning wildly on his leash. As you can imagine, Jesse doesn’t swim. He can, we determined. Maurizio once carried him into a lake and he swam back, beeline, and might have continued his outraged trajectory far inland if I hadn’t corralled him. The idea of people he loves jumping (from his point of view falling) into water is horrifying. At friends’ lake houses he barks and howls frantically on the dock at every splash. Helpless to stop the calamity, he can at least call for help, like Lassie fetching the sheriff. “Lassie pulls the child to safety,” however, is not in Jesse’s script. All this is a prelude to a dream I had recently of standing on a rocky coast with a quick drop off. It’s cold; the water is frigid, and suddenly I see Jesse just under the surface, swimming desperately. His head is underwater. “Lift your head up!” I call, but he doesn’t. He’s frantic. Buffeted by waves, he can’t endure much longer. Fully dressed, I jump in the icy water and haul him out. I wonder if this is a metaphor. So often we’re desperate when help is so close, just lifting our heads out of water. But fear keeps us down. I try to hold this little thought as I push through the outline for my next novel. Lift the head and swim. Lots of dogs can do it.